Process and skills are only part of the equation. How you use these shifts you into awesome. This is the ‘how’ of Personal Mastery. When you have the ability to choose your actions rather than react then you have the ability to choose your experiences and what happens next. 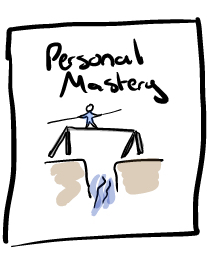 Where is your Personal Mastery at ? Are you living from reaction or from conscious action ? How do you even make that shift ? I have been on the Personal Mastery journey for probably two decades (which says a lot about my age that I am not sure I am ready to accept yet, so moving on swiftly) and shift I have. From highly reactive and I have to confess, largely oblivious of the impact I have on people and so delivery to, well I hope far more self-aware, gentle and inclusive. What did it take to get from ‘there’ to ‘here’ ? Knowledge as well as practice. Along the way I discovered the power of one-on-one coaching and became hooked on the space created. A space I could speak openly about what I was thinking and with the help of my coach, see for myself how that thinking was keeping me stuck and creating the outcomes and experiences I was trying to change. I have learnt how it takes more than thinking to create a change, it takes a new set of moods to live by. I never knew that moods became habits. I never knew that I could choose my mood and that the only reason I was stuck in resentment and anxiety was because I had spent a lifetime practicing these. I also didn’t know that moods change what is possible. When I am anxious I can’t see new possibilities – my world shuts down on me. The most interesting part of my Self Mastery journey has been the discovery that my physical body is part of it all. My body stores the unconscious programs I react with. In fact, there is a 17ms delay between me experiencing something and my brain interpreting it and in the 17ms I have already reacted thanks to the patterns and habits my physical body has stored. When I change my posture and open up, I change my mood ! When I change my mood I change my thoughts and when I am in that space, anything becomes possible. These days I have wrapped all these aspects into my workshops, especially the Experiencing Your Self workshop which is 3 days of really seeing yourself in action and seeing the impact you really have. I know work from my Why so I have a strong sense of purpose and a way to reset my thinking and my self when I find myself in old habits. It takes more than just knowledge, process and skills to live from and in awesomeness. It takes Personal Mastery. Where is your personal mastery at ? How are you supporting yourself in levelling up ?